I was arrested by the emotional power of the written word on my visit to Sweet Briar College several weeks ago. Gay and I had traveled down to Amherst County to participate in a poetry reading featuring recent work of writers resident at the Virginia Center for Creative Arts across the highway from the college at Mount San Angelo. 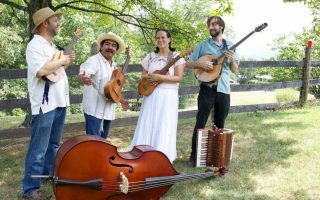 The VCCA’s Mount San Angelo campus is situated on the grounds of a historic Virginia estate and blessed with miles of rural Virginia landscape in many directions. The poems featured in this reading were all poets’ responses to their sublime experiences living and working quietly in the Virginia landscape. 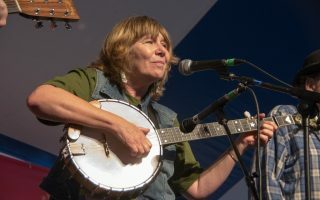 The poetry reading, held in Sweet Briar’s Pannell Center Art Gallery, was complimented by an exhibition of visual art inspired by landscape from Sweet Briar’s fine collection of art. The event was the ideal distraction for a cold and wet February afternoon. After a convivial reception and tea, our host, Carrie Brown, the college’s writer-in-residence, took us on a short tour of the neighboring Cochran Library, part of Sweet Briar’s original historic campus. Walking to Professor Brown’s office, I came stock still in a stair hall as we passed a display of student artwork. Here was a small yet overwhelming exhibit of eight framed broadsides. Working in the same medium, I recognized the style of these pieces. A cool classic text design contrasting with a stark illustration positioned to draw the viewer in and lead them to spending time with the accompanying text. I was jolted from what had been a pleasant rather pastoral reverie by these stark black and white linoleum cuts illustrating the poems of Afghan women. 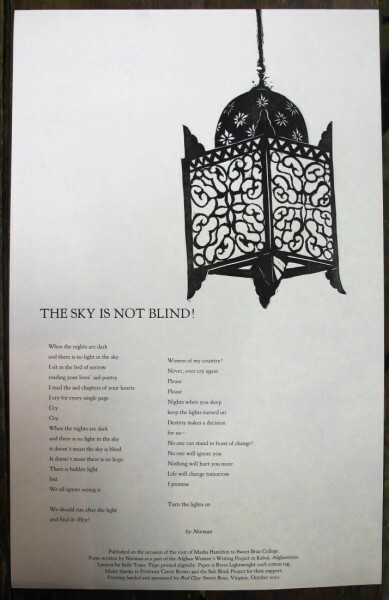 Another large broadside featuring the poem “The Sky is Not Blind!” also by Norwan. These writers living in a war-ravaged landscape, are participants in an amazing program which encourages and facilitates expression through the written word. The illustrations drew me in, but the words of these women transported me to the world of human struggle of which I had only been vaguely conscious. Cries of pain mingled with hope made their way through the Afghan Women’s Writers Project to these library halls where they served to embrace me in a reminder that human emotions span a range of feelings which represent not only the sublime, but also the grotesque gamut of human suffering. I was stunned and overwhelmed by the power of these works of art and resolved to share my experience in this article. I have been working with college students creating broadsides of poetry and smaller pieces of prose for several years, so I was not surprised when Sweet Briar’s professor of creative writing Carrie Brown had called me last Fall and asked if some of her students might come on a Saturday morning and visit the Virginia Arts of the Book Center. Their morning was planned around the opportunity to view some of the many different broadsides printed by the artists of the VABC. The students excitement filled our small classroom as we explored the wide range of work which had been translated by type and illustration into pieces worthy of wall display. I had no idea that this brief conversation would lead to such intensive work by several students. 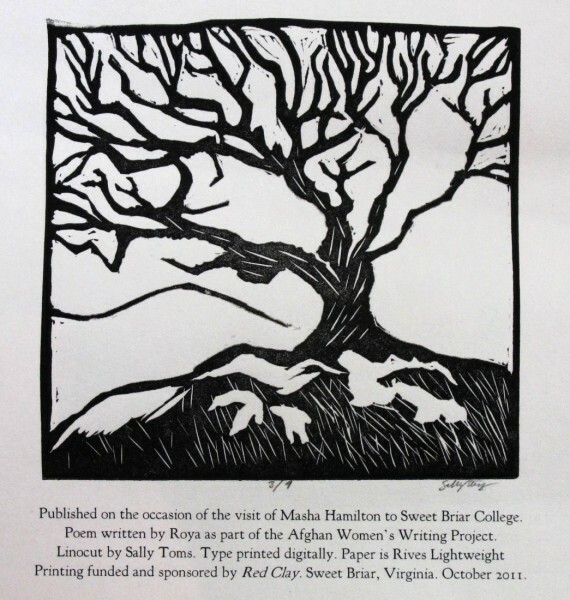 Sweet Briar juniors Sally Toms and Kaitlyn Holloway, with the support of Professor Brown and art professor Laura Pharis, had been inspired to publish broadsides of work created by the Afghan Women’s Writers Project in honor of a visit by the 2009 founder of this program, journalist and author Masha Hamilton. A closeup of Sally Toms’ linoleum cut image for the “If I Don’t Write” broadside. Back in the rolling landscape of Virginia’s foothills, Sally and Kaitlyn had decided they would put their creative efforts to work publishing the writing of their Afghan sisters. Working late hours between classes and other activities the students’ output was phenomenal. 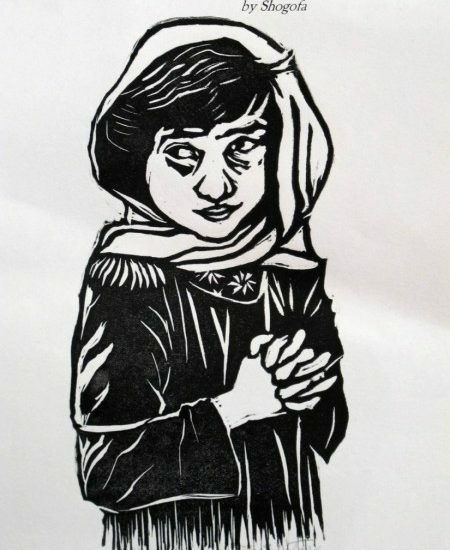 They produced broadsides of eight different pieces, each with its own original linocut in an edition of 180! A very daunting semester’s project for what would normally require an entire class of students. In addition to these pieces, the pair created three original monoprints for auction during Masha Hamilton’s visit to the college. The students successfully marketed their newly published work collecting $2200, enough to purchase a laptop and provide the very expensive Afghan wifi access for one woman for a year. Inspired by their success, the students printed an additional edition of fifty selected pieces for fund-raising use by the Writing Project. This creative pair’s energy is growing as they discuss future projects with other nonprofit organizations. Having discovered the power of collaboration in the creative process and enjoying the rewards of working together, Sally and Kaitlyn plan to grow their publishing and fund-raising program. Sally and Kaitlyn recently joined eight other Sweet Briar students in a semester-long internship at the Virginia Arts of the Book Center. They are learning how to search for just the right type to set a poet’s words as they poke through our multitude of wooden type cases. Discovering hand composition and learning to impress the image of the writer’s voice into the magical surface of paper seems a logical next step for these artists. It is a slow technology which encourages the reflection required to fully appreciate the power of words. I am very excited to see what these two students produce next as they master these centuries-old skills! Josef Beery has worked at Ten Flavors Studios in Charlottesville, Virginia as a publication designer for almost three decades. He is a cofounder of the Virginia Arts of the Book Center and an early organizer of the Virginia Festival of the Book. He shares observations on the fields of typography, printing, and books to promote discussion and interest in the activities of the VABC.